Whether you want a genuine vintage or antique piece, an item crafted from reclaimed materials, or a new piece of furniture with a great industrial style, there are lots of wonderful options out there. Several retailers specialize in this type of furniture or have a great selection of items that will add industrial beauty to your home. Vintage Style Metal Cabinet Bedside Table - This nightstand has a utilitarian look that will add an edge to any bedroom decor. The silver metal has a distressed surface and the table features one drawer and one door for storing your bedside necessities. It retails for about $200. Amazing Adjustable Industrial Table - With a turn-of-the-century design that allows you to turn a crank to adjust the height, this piece can function as a coffee table, bar table, or small dining table. It features a cast iron base and round, 26-inch distressed wood top. It costs about $700. U.S. customers should be aware that Rockett St. George does not ship furniture to the United States, although smaller items can be sent. However, postage costs on returned items are not covered by the company, so returning items can be expensive. It's best to contact the company directly for the most up-to-date shipping information before placing an order. Flatiron Dining Tables - Available in two heights and several different sizes and finishes, these tables feature cast metal bases with industrial-style cross braces and real working casters. The table tops are crafted from authentic reclaimed elm wood doors. Prices start at $635. Industrial Tool Chest Glass Sideboard and Hutch - For a high-impact dining room piece, consider this spectacular sideboard and hutch. Inspired by a turn-of-the-century French automotive factory toolbox, this glass and iron display unit can show off your favorite dinnerware and store linens and other necessities. It comes in two sizes to fit your dining room and budget starts at about $2,000. Shipping rates vary depending on the size and weight of the item, but Restoration Hardware uses local delivery companies to provide affordable white glove service. They do not refund shipping costs for returns, but they do accept returns with proof-of-purchase. If you must return your furniture because the delivery person cannot fit it through your doorway, Restoration Hardware offers store credit rather than a refund. Vintage Industrial Tables - With options ranging from occasional tables made from dairy cream separators to long buffets or sofa tables featuring boxcar wood and industrial machine bases, there's a lot to choose from. Outfit your dining room or any other room in your home, starting at about $300. 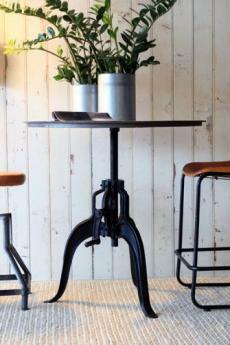 Vintage Industrial Stools - You'll find incredible pieces like wall-mounted, swing-out stools sourced from factory lunch rooms and assembly line worker's stools with wooden seats and backs. Most are wood and metal, and some feature original paint. Prices vary significantly and start at about $150. You can shop at the Chicago showroom, or Urban Remains will ship items to you. Shipping rates depend significantly on the size and weight of the piece, as well as your location. The website does not specify the return policy, and users on Yelp have mixed reviews about customer service. It's best to be sure you will love the piece before you buy. Industrial Desks - Choose from basic options like a factory foreman's desk or seven-foot desks made from adjustable machine bases. Prices vary significantly, ranging from about $1,500 to well over $20,000. Drafting Tables - These are actual drafting table used by engineers in turn-of-the-century factories. Most have cast iron bases and wood tops. Prices start at about $4,200. You'll need to log in to the website to view prices of inventory, and you'll have to call Get Back, Inc. to purchase items and arrange for shipping. They will ship anything for a price that depends on weight, size, and location, or you can pick up your purchases at their Oakville, Connecticut store. You can return any piece within 10 days of purchase. Reclaimed Pine and Iron Bookcase - With an iron pipe frame and asymmetrical reclaimed pine shelves, this simple design is uncluttered and modern. At 32 inches wide and 102 inches high, it will make a statement in your living room when you load it up with your favorite volumes and artifacts. It retails for about $1300. Cross Base Dining Table - A tempered glass surface tops this simple and modern table constructed with sturdy metal. It offers a clean design for your dining space. At 72 inches wide and 32 inches high, it will fit in a modest kitchen. This piece retails for about $550. Shipping costs depend on the price of your order. For orders $200 and over, you'll pay 10% of your order cost to cover shipping. West Elm accepts returns for any reason within 30 days, but shipping costs are non-refundable. Buying industrial style furniture is an investment. Keep the following tips in mind to help you choose items you'll love for years to come. Genuine antique pieces come with a sense of history, and they are usually unique. However, they may have condition issues, and they may not be as sturdy as new items. Antique pieces are often more expensive, especially if they are rare. New furniture is sturdy, and it can give your home a contemporary feel. However, you might see the same pieces in your friend's house. These pieces tend to be a little less expensive than genuine antiques, but some items can still be costly. If you're shopping for genuine vintage pieces, learn how to identify antique furniture. From the joinery styles to the manufacturer's labels, there are many clues that can help you. In addition, find out as much as you can about the value of the item so you can ensure you're getting a good deal. If possible, ask the retailer to provide provenance, or history, about the item you're considering. This is important for value, and it's also fun to know the story of your industrial furniture. This might include information about the factory where the item was used, the original purpose of the piece, or the industry in which this item originated. Many industrial-style pieces use reclaimed materials, such as railroad ties, factory flooring, old plumbing fixtures, and other items. 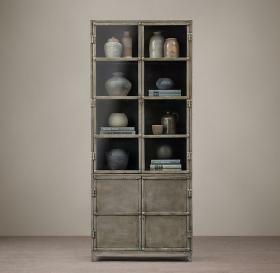 If you're considering a piece that has reclaimed components, it's essential that you understand it will have character. Because of their reclaimed nature, these materials include scratches, dings, nail holes, and patina. They won't look new and perfect. Ornate - Pieces from the late 19th century or those inspired by this era tend to have intricate designs featuring curved lines, scrollwork, and other embellishments. Rustic - Some items feature chipped paint, weathered wood, rusted metal, and other elements that suggest age and significant use. Modern - Other pieces have the clean lines and simple design of modern furniture, even though they utilize the components or style of industries past. Because they were designed for use on factory floors and warehouses, many antique or reproduction industrial furniture items have a large scale. Often, these are statement pieces that can dominate a small space or crowd out other furniture. Additionally, these items may not fit through doors or up staircases. Before you buy a piece, make sure you take its measurements into consideration. That way, you can make sure it will look stunning in your home. From genuine antiques to modern pieces made with reclaimed materials or in the industrial style, there are many lovely options to add character and functionality to your home. If you take some time to consider the type and style of industrial furniture you want, you'll end up with pieces that you will love.